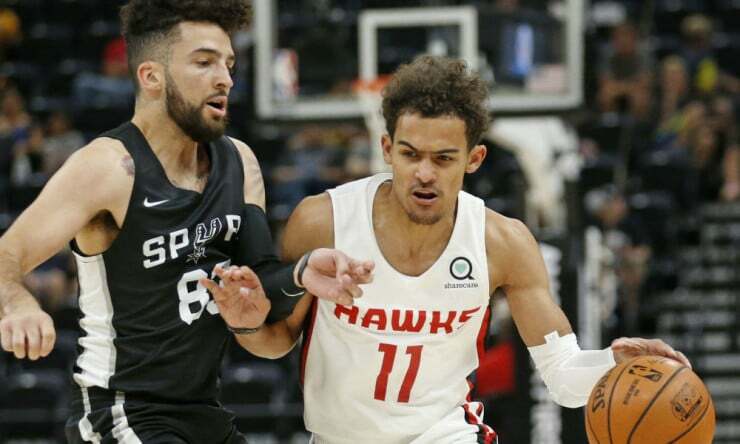 With NBA Summer League in full swing, spanning smaller tournaments in Utah and Sacramento plus the main event featuring all 30 teams in Las Vegas, Basketball Insiders has you covered. Today, we’re taking a look at the early studs and duds of summer – guys who, during the earliest and generally most important part of the tournament, are either impressing beyond expectations or really disappointing. This can be a tough area to parse at times. Statistics are only of limited use in small samples like summer tournaments. The very best performers will stick out here, and extreme outliers can definitely tell us something, but it also takes a careful eye to identify which guys are meeting the kinds of expectations placed on them – which are often very different from team to team and player to player. With that said, let’s dive in. Bluiett, an undrafted 23-year-old out of Xavier, had declared for both the 2016 and 2017 drafts before withdrawing and returning to school. He was passed over after running out of eligibility, but he’s quickly making himself known in Las Vegas. Bluiett burst onto the scene for the Pelicans, scoring a blistering 50 points in his first two games – both off the bench, no less. He put 24 on the Raptors on just 10 shots and 19 minutes on the court, canning 6-of-8 from the three-point line. A day later, he went 6-for-10 from deep en route to 26 points in 21 minutes in a rout of the Miami HEAT. The 6-foot-5 shooting guard cooled off a bit in his third outing, with “just” 13 points, but he’s still shooting 60 percent for the tournament and has committed just three total turnovers in three games. Bluiett is an unrestricted free agent at the moment, and it’ll be interesting to see if a team looks his way. He’s a bit on the older side for a summer league breakout at 23, but the league has begun to come around more recently to guys in that vein. Young is a perfect example of the way stats can, at times, be misleading in summer tournaments like these – particularly shooting numbers, which are prone to big swings over tiny samples. The fifth overall pick in the 2018 draft has really struggled shooting the ball, both in Utah and in Las Vegas, but while there’s certainly cause for concern there, it’s the other elements of his game that have us listing him as a stud here. Through two games in Vegas, Young has racked up 14 assists compared to just six turnovers, an excellent ratio – and one that’s more sustainable over the long run than missed shots that he’s shown he’s capable of making. He’s getting to the free throw line a ton, with 29 attempts in five summer games across both venues, another positive and generally sustainable sign. And while there aren’t any stats to back it up at the summer league level, Young has shown a strong work ethic and mostly decent positioning defensively, a surprise benefit for a guy many projected to struggle heavily on that end against NBA athleticism. There’s still some reason be skeptical about the shooting, and perhaps about Young’s ability to consistently create separation against strong NBA defenders. But some of the worries at this point are overstated. The fourth overall pick in the 2016 draft, Bender never really stood out at his first two summer leagues – but he is this time around, and for all the wrong reasons. Remember how shooting stats can be deceiving in these tournaments? Well, Bender is pushing a pretty sizable sample at this point and challenging that notion. Through his first two games in Vegas this year, he’s now shooting an embarrassing 32.6 percent from the field in 12 summer league games dating back to 2016. This year has been his worst showing of the three, as well – as of this writing, he had attempted just 12 shots and made just two. Bender isn’t rebounding particularly well, isn’t creating for others, and outside the occasional highlight-reel weak side block, he’s not standing out defensively either. To say this is worrying would be an understatement – Bender is a third­-year lottery pick playing in summer league, and guys in that position should be dominating. This kind of completely invisible performance should spark some serious concerns about his future in Phoenix if he doesn’t turn it around quickly. The theme stays consistent here with Ellenson, who like Bender is in his third summer league after going in the top-20 of the 2016 draft. Unlike Bender, Ellenson had at least shown some signs of life in previous years – he averaged 17 points and seven rebounds last year in Vegas on a respectable enough 44 percent shooting, albeit while taking a ton of shots. This year? He’s chucking to an almost insane level, and it isn’t working out. Ellenson has taken a ridiculous 49 shots in three games, making just 14 of them – that’s 28.5 percent, for the folks counting at home. He’s pulling down boards, which is good, but he’s also turned the ball over a ludicrous 16 times in those three games, or over five times per game. For a guy like Ellenson, the 18th pick in 2016, this just isn’t good enough. He’s 21 now, older than many of the guys he’s playing against, and this kind of inefficiency is really concerning. The Pistons had better be hoping this is a huge outlier, to say the least. Keep up with Basketball Insiders through the remainder of 2018 NBA Summer league for more on-site videos, updates and articles.